Cindy turned her culinary interests into a professional career in 2005 after her fun tech career at Apple and Netscape. She was a cooking instructor at the Palo Alto Adult School for a decade. She now spends all her time spreading the word about culinary adventures via La Toque de Cindy and the Slow Food movement. 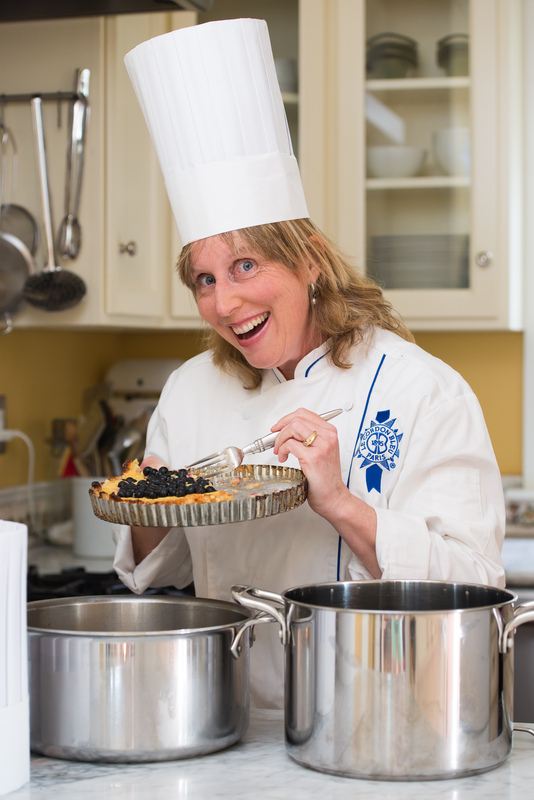 Cindy coaches executives and staff in team building cooking exercises, hosts private cooking party events and teaches the pleasure of cooking at summer cooking camps for children and teens. In service to the community she has run a meal delivery service for families in need has worked at the Food Closet in downtown Palo Alto and donates cooking classes to support local schools and non profit fund raisers. Cindy’s training includes coursework at Le Cordon Bleu in Paris and instruction from the Bay Area renowned chocolate masters Alice Medrich, John Scharffenberger and Michael Recchiuti. Her claim to fame came when the Food Network asked her to compete on their Guy’s Grocery Game show. Cindy promotes fun in the kitchen for kids of all ages. From her kindergarten days when she marked that cooking was “fun” and not “work” on an exam, Cindy has spent her lifetime having fun in the kitchen and promoting this in her circle of friends, students and co-workers. La Toque de Cindy brings this magic of cooking and culinary fun to you through a series of hands on cooking classes, private events, food tastings, culinary books and camps. Her business is named La Toque de Cindy and France is where Cindy believes all good food comes from. She lives and teaches in Palo Alto, California, and brings lessons learned in Paris and California to you. The specialty at La Toque de Cindy is chocolate but you’ll see by the class listings and publications the commitment to California cuisine with international twists from her travels, organic agriculture, developing an enthusiasm for home cooking and fabulous food. The promotion of budding chefs is key to her mission as a way to inspire the next generation to “get back to the kitchen”. What’s a Toque? Wearing a toque is a time honored tradition in the world of chefs. Each fold in this hat represents a dish mastered by the chef. The higher the toque the more of a big whig that chef is.